Something I Made: Who's Afraid of Messy Play? Who's afraid of messy play? Well, frankly, I am. The house gets messy enough without the play being officially deemed messy - ie involving sand or water or (horror) both. Coco went to nursery from when she was 10 months old, so I relieved myself of any obligation to let her do messy play at home. Judging by the state of her clothes when I picked her up on my way home from work she had plenty of exposure to paint, play-doh, sand and other sticky substances. But poor Henry is deprived (in a very middle-class sense of the word). 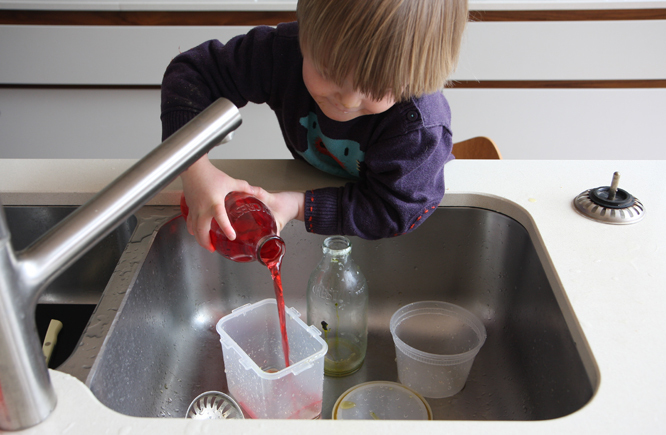 His messy play boils down to, play doh, helping with cooking (when I'm feeling adventurous) and water play. 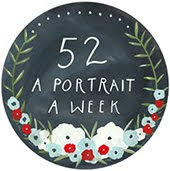 Oh, and he has used paint, um, a handful of times. He often gets the paints out of the cupboard and brings them to me hopefully and it's a constant battle to keep him away from the sink. So the other day I let this happen (and I admit, it's not that messy... but surely it's all about the potential)? 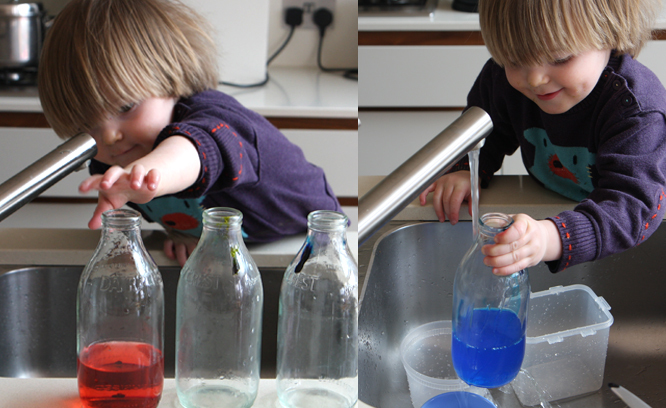 I put some tiny specks of gel food colouring (as purchased for the making of a rainbow cake many moons ago) into milk bottles, so that as Henry filled them with water they made coloured water. I just gave him more and more containers... and occasionally topped up the food coloring, but as it was gel it didn't always totally dilute, so actually lasted quite well. We did a bit of colour mixing too which amused Henry no end. He kept saying "What's 'appening!?" And it was fun, fun for Henry and fun for me to watch (just a bit tricky to photograph well). 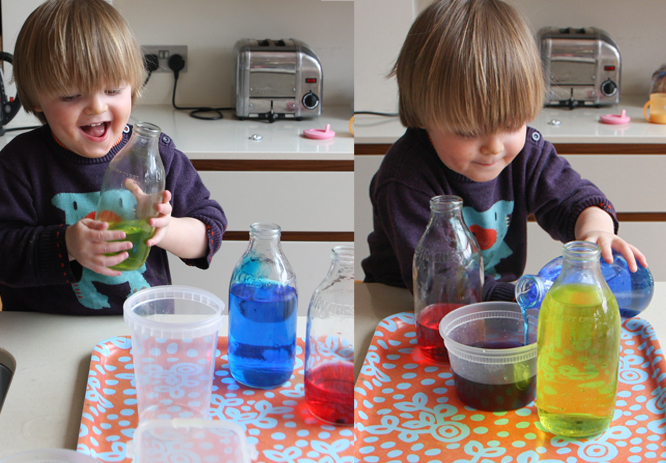 Some food colouring, some bottles and tubs, and a very happy boy. I need to let go and go with the (potential) mess more often. And of course, hooray for sunshine, now this can all happen outside again. Someone suggested this to me the other day as an outdoor game since it washes off brick or wood with a hose or the rain (don't sue me if proves not to be the case, I haven't tried yet!) Mix some colours in water just as you did, tell the kids very seriously that they have an Important Job and they need to paint the wall/bench/fence, then sit back with a magazine for an hour while they toil seriously away. Winner! 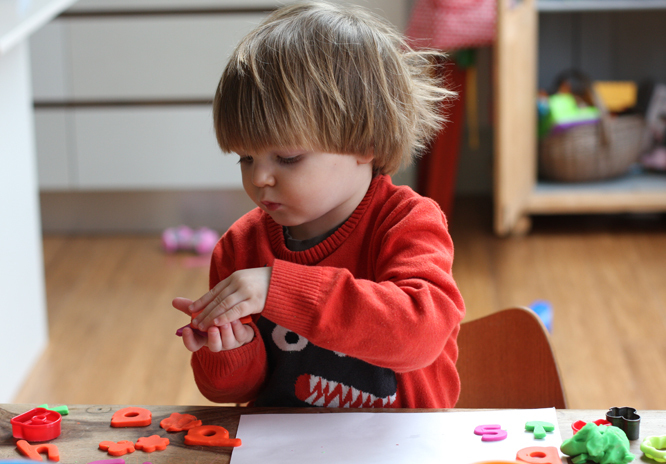 I used to be afraid of messy play, but you do get over it when you see how much fun they have. Firstly steer clear of food colouring as it will stain clothes and use some child friendly washable paint watered down!